It’s hard to believe that an unassuming, largely unscripted movie that started out as a BBC mini-series about two frenemies eating good food across Great Britain would spawn a legitimate comedic franchise. But that’s where we are as we look to this week’s release of The Trip To Spain. Once more Steve Coogan and Rob Brydon, both playing slightly fictionalized versions of themselves, are pairing up and heading out for a road trip. After first tackling England and then Italy, they now take their bit to Spain. Once more Coogan has been asked to review restaurants as part of the publicity for an upcoming movie and recruits Brydon into that trip. And so they set out for long drives, incredible food and conversations that include their careers, sniping at each other in a (mostly) friendly way and sharing their dueling impressions of other celebrities. The poster doesn’t do a whole lot, but it doesn’t need to. 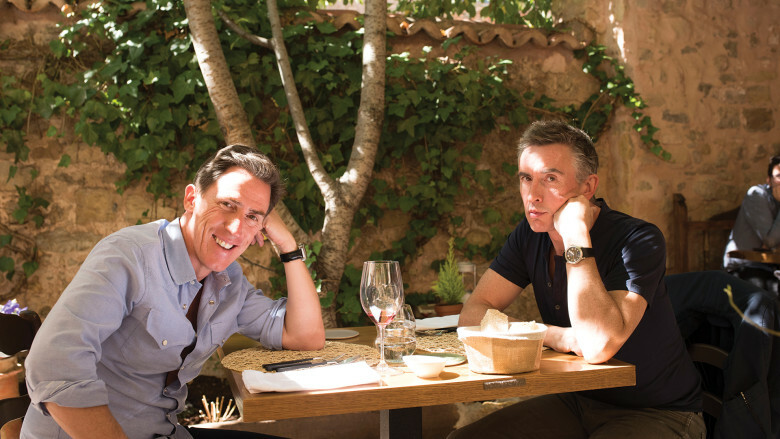 Coogan and Brydon are shown at a big oak table with a handful of exquisitely-crafted food dishes in front of them, Brydon pouring a bottle of wine. That’s it, that’s the entire premise and the entire message that needs to be sent to the audience. There’s a quote at the top that praises the movie and copy making it clear “The two amigos are back” but otherwise the image of the pair is all we really need. The first teaser didn’t show much but it presented everything audiences might be wondering about. It’s just Brydon and Coogan in a car driving along the Spanish coast while beatboxing and freestyle singing. That’s it. There are some title cards that place this in the context of the first two movies as well as positive pull quotes from critics, but that’s about it. 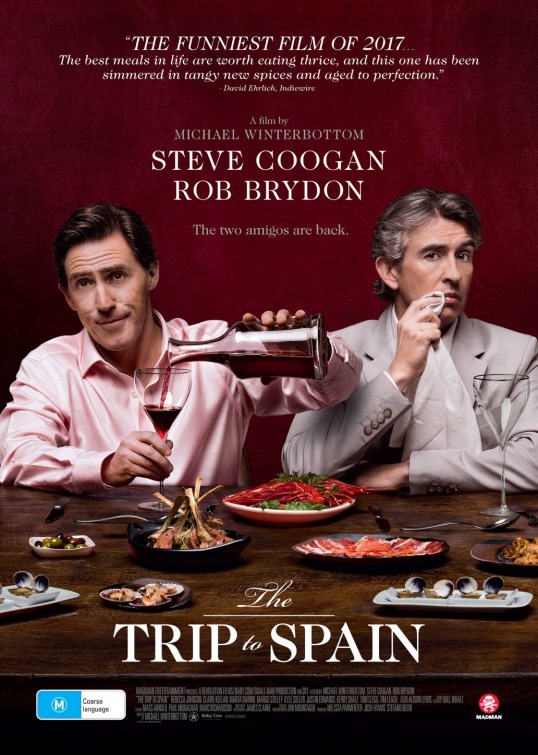 The first official trailer starts off by immediately setting the premise, which is that Coogan wants Brydon to engage in a trip to Spain. We see them engaging in their usual banter, including their dueling impressions, as they eat incredible food against amazing backdrops. What else needs to be said? It’s fantastic, promising just what we love about this series of movies only in a different section of the world. Perfect. Not much on the web for the movie. IFC has a page on its site that has a synopsis, the cast and crew list and the studio gave the movie some promotion on its own social channels but that’s about it. Nothing I’ve come across. It’s likely there’s been some advertising done overseas for the BBC series, but I don’t think anything happened on the paid front in the U.S. The studio knew exactly what it was doing, starting off the campaign by releasing a clip featuring Brydon and Coogan doing impressions, including another excuse to do their dueling Michael Caines. The movie was one of those announced as screening at the 2017 Tribeca Film Festival. There doesn’t appear to have been a big round of press or anything else, though, meaning the studio is relying mostly on word of mouth and familiarity with the first two movies to get people motivated. It’s absolutely understandable that this marketing campaign doesn’t rise to the level of other summer releases. It’s about as small-scale as a film can be, with just two stars that U.S. audiences will mostly tag as “Oh, that guy who died in the opening 10 minutes of Tropic Thunder” and “The other one.” The story revolves completely around food and conversation and, if the previous two movies are indicative, very low stakes. But it succeeds by very specifically telling the audiences that have enjoyed those other two movies that this is more of the same, just slightly evolved. The premise is the same but the characters have changed a bit since we first met them. Not so much, though, that we’re not going to get more cracks about Coogan needing the best room and making his career seem bigger than it actually is. And Brydon will be there insisting his impressions are better and more than happy to take his friend down a peg. That’s the formula that’s worked so far, so the existing fanbase is being told it won’t be tinkered with too much here.